So I decided to put together a list of things kids wished their parents knew about money. I’d rather have your time and attention than more stuff. I understand that you have to work, but I really love you and want to spend quality time with you. I’m watching how you manage your money. I see how you respond to financial challenges. I hear how you talk about money. Later in life, I’ll tell my friends and children about how you managed your money. I will use it in examples as I teach my children. I’m not as interested in receiving an inheritance as I am in seeing you enjoy the fruit of your year’s of effort and sacrifice. One day I will clearly recognize how hard you have worked to establish financial margin and a nest-egg. I want to see you enjoy it and continue to pursue your hopes and dreams. I know when you’ve sacrificed to provide me with something special. I’ll never forget the toy you sacrificed to buy for me. When you sold something you held dear to send me to camp, I noticed it. I hear how you talk about wealthy & poor people. I will gain much of my world-view from you. If you view wealthy people as “greedy,” I’ll probably pick that belief up too. If you view poor people as “deserving” of their position in life, I’ll probably repeat it to others. On the flip side, if you view it as a privilege to help the poor and respect those who have managed to build wealth, I’ll do the same. If you stress about money, I feel it. I may not be able to completely identify what is wrong, but I will know it is related to money. I’ll watch to see how you react to the situation and the attitude you maintain throughout the financial challenge. It’s okay to say “no” to me when I ask for something. I won’t like it at the time, but I’m really testing boundaries. I will learn that it is indeed possible to survive without the item. I know if you are selfish or generous. Generosity and selfishness are both contagious. I’ll model your behavior. Anything you would add to this list? 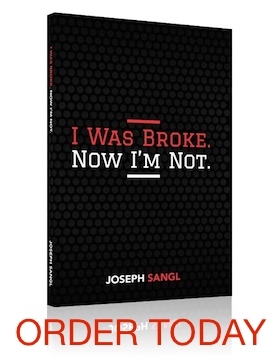 I invite you to share your thoughts on our I Was Broke. Now I’m Not. Facebook Page. As a father of older teenagers, I am seeing now how truly spot on this message is. As they begin to ask questions about affording university, how mortgages work, how much and why we give to the church, etc., I can see how they understand why we had to say no to some things when they were younger. It is great to see the maturity and appreciation developing. On our refrigerator we taped two statements from debts with PAID OFF written on them. We haven’t really said anything specific about them. Yesterday, my six year old son said something about it being good that we paid off the debt and how debt pushes you down but no debt makes you stand up with no weight.?! He is listening, watching, and drawing conclusions whether we are intentional or not. I/we want to be intentional about giving him a solid financial education in balance with what is important. I have to learn and build new financial habits and skills as I would in my spiritual life, exercise life, professional life or any area I am trying to grow or improve.